Free flowing Cava, champagne cocktails, beer, Spanish Sangria and soft drinks. Note Premium bottle service is available on request. A dinner will be served on board by a professional on board chef – Traditional Spanish Paella, with a side salad (Vegetarian/ vegan/ gluten-free options available on request). Overview: The Champagne Sunset Cruise! Do you and the guys want to add a premium VIP experience to your stag do? Well, look no further than the champagne sunset cruise in Barcelona. You will all live the high life aboard a catamaran on the Mediterranean, savouring an unforgettable night of drinks, food and prime partying. The night begins with a warm welcome, a drink and shot at a local beach bar while you register to board. 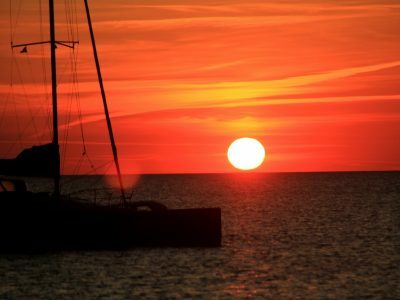 Once you make your way onto the glorious catamaran, the champagne sunset cruise in Barcelona truly begins. Free-flowing cava, champagne cocktails, beer, sangria and soft drinks will be readily available. Chilled live music will set the tone for an amazing traditional Spanish paella dish cooked by professional chefs. Watching the golden sun hit the horizon with a beer in hand aboard a catamaran is a really special way to celebrate with your stag. When the two and a half hour trip comes to a close, you will return to Barcelona’s port that is now alive with noise and fun. To give you the complete experience, you will also receive VIP entry to one of Barcelona’s top nightclubs here. Please note that check-in opens one and a half hour before the catamaran is set to leave, and closes 15 minutes before. It is really important that all members of your group arrive on time.